TIBCO Mashery continues to provide tools that enable modern API development and documentation practices. 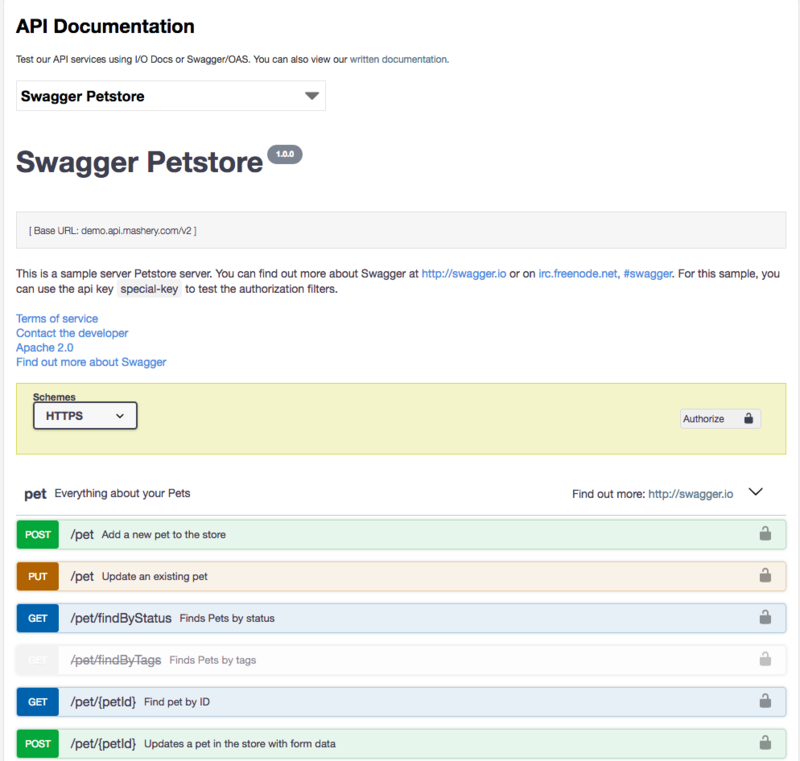 With our improved native Swagger/OAS support you can easily import, manage and display Swagger 2.0 and OAS 3.0.x along side Mashery's own IO Docs format. New Feature: Call Log Stream! We are very pleased to announce the General Availability of the Call Log Stream feature. 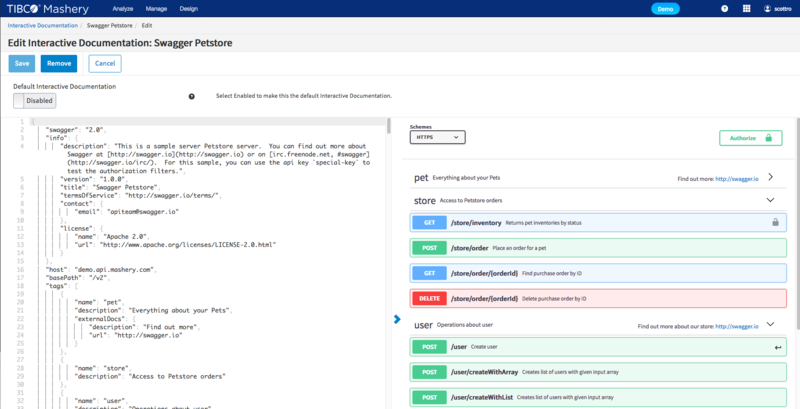 This unique in the market feature provides real-time, low-level transactional information about your API traffic whether you deploy our SaaS traffic manager, on-premise or in a hybrid deployment. As the ‘front door’ for your APIs, knowing what’s happening with your traffic from Mashery’s perspective is critical. Enriched transaction data containing information such as package, endpoint, URI, IP address, and many more! Visit the Online Documentation to enable this feature today! Mashery Local - v4.4 was made Generally Available as of last Friday. Improved end-to-end monitoring - provides the ability and instructions to forward Mashery Local access logs to TIBCO LogLogic. TIBCO LogLogic provides log management intelligence technology to provide end-to-end visibility and monitoring over all your applications and IT systems. We are happy to announce that we have released a new feature this week called API History. This feature allows an Administrator to compare versions of API configurations to see what changed between versions, as well as exposes Audit information such as the time/date of incremental changes, and the username of the person who made the update. This feature is available to all customers, and is available on the left hand navigation for API Definitions. Keep an eye out for continued iteration to this feature, as well as related Audit features coming soon! Mashery Local - v4.2 was made Generally Available as of last week. Expanded support to additional platforms - e.g. RedHat OpenShift. TIBCO Mashery is ever evolving and we are proud to announce that TIBCO Mashery has become an intrinsic part of TIBCO Cloud. TIBCO Cloud Mashery is the next step in bringing all of the TIBCO Cloud offerings closer together, giving you, as our customer, a one stop shop for all Software as a Service offerings from TIBCO. Our existing Mashery customers will not see this at first, since we are hard at work to ensure that their transition to this new platform is seamless. All our new customers will onboard via TIBCO Cloud, to access, sign up now for our free trial here. TIBCO Cloud Integration - Wherever your applications and APIs are, use your browser to quickly and easily connect to them. TIBCO Cloud Live Apps - Rapidly create and deliver smart business apps with an intuitive and easy to use low-code platform. TIBCO Cloud Messaging - High performing web and mobile apps require real-time exchange of information―exactly what TIBCO Cloud™ Messaging provides. TIBCO Cloud Spotfire - A cloud analytics software-as-a-service platform designed for data visualization and discovery. Everything you need is available on the cloud — no installation, just analytics. TIBCO Cloud is the one stop shop for all customers using TIBCO's software-as-a-service offerings, and Mashery is now an integral aspect! This will hopefully help you as our customer to get to success more quickly and easily! Any feedback on this is welcome, please tell us how we can make this an even better experience! Mashery Local 4.2 is GA ! Greater flexibility for administrators to upgrade components. As API management solutions continue to become more and more important for any enterprise, the need to increase connectivity and ease of use in setting up your APIs as early as possible is a must. In order to help you, as our valued customer, in decreasing your API lifecycle time, as well as allow for quicker feedback on the API design, TIBCO Mashery® now comes bundled with the API mocking and modeling capabilities of TIBCO Cloud Integrationtm. TIBCO Cloud Integration comes with an online, zero code API modeler, that allows you to model your JSON specification using a graphical interface. You can start from scratch and define your API using this, or you can bring your own by importing your specifications from file, URL or GitHub. For all functionality available in the API modeler, please click here. Once your API is present in the environment, you can start setting up your mock application with a simple click of a button! It will generate a skeleton API Mock app that allows you to add your simple responses to the API and it will run it physically for other to test and use. In order to support more complex types of API answer, you can switch to advance responses that will allow you to use java script to make your mocked API more dynamic and life like to test out different scenario's, like setting up response filters and more elaborate security schemese in Mashery before you expose the real API. Feel free to click on each application type to find out more about them, or even better just try them out! To make it as easy as possible to use this functionality, the home page of the control center has been updated. The top level nagivation now has a grid icon that allows your API manager and administrator to reach these capabilities very quickly. The Integration capabilities are part of TIBCO Cloud and to ensure that everyone can use these capabilities, a TIBCO Cloud team needs to be setup by your Mashery account contact, this is a simple, one-time process to setup your account. Instruction on how this works can be accesses here. If you have any questions about how to proceed, or run into issues setting up your account, you can contact us at support.mashery.com.